The first Nordland bunad for women was presented at the Hålogaland Young People’s Society in 1928. The background information was gathered by a group from within the Society and was also designed by them. It was meant to be the formal costume for all of North-Norway. In the last century women from this area wore plain dresses for everyday life and silk dresses for formal occasions. When this bunad was designed the group wanted to get away from imported fabrics and to use traditional Norwegian fabrics. The pattern design was copied from a bride’s dress from Ravassåssen in Vefsn, and the embroidery on the bodice and hem of the skirt was copied from embroidery found on the fabric of a plastron (breastplate) and purse from Røyten in Vefsn. The apron pattern came from Hartfjelldal, and the hat was copied after a black hat used in the latter portion of the nineteenth century but now green cotton or wool with a thin band of white lace edging framing the face is used. 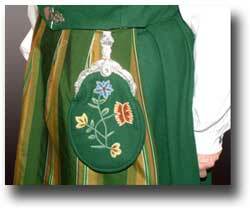 This bunad is made of green wool. The skirt and bodice are made of the same fabric and color. The skirt is pleated in the front and finely pleated in the back with a band of floral wool embroidery at the hem. The bodice, which is attached to the skirt at the back and sides, has floral design wool embroidery on the front as well as on the back, and closes with two pressed or engraved silver hooks and a concealed hook at the top. The unattached purse is of the same color wool fabric as the skirt with similar wool floral embroidery on the front, closing with a silver clasp with a pressed floral design. The apron and shawl are made of green and gold plaid mercerized cotton and the shawl has a knotted fringe. The shawl is worn tucked into the bodice. Blouse is made of white linen with a band of white embroidery at the neck and cuffs. The silver jewelry is specific to this bunad and was designed by goldsmith Rørvik in Mosjøen. The sølje can be a small or large brooch, or both, in either oxidized or polished silver. The cufflinks are made of pewter with a pressed floral design. Black or white shoes with silver buckles and white hose are also a part of this costume. Another variation of this bunad is made of blue wool. 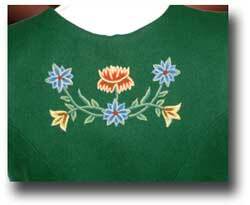 It has the same embroidery on the bodice, shirt and purse as the green bunad. The blue bunad also has a matching blue hat. The apron and shawl are made of blue and gold mercerized cotton. The clasps on the front of the bodice can also be made of pressed pewter. 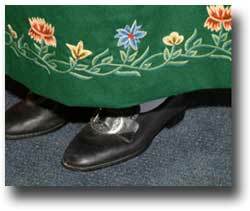 An outer garment for this bunad is also available. The cape is modeled after a cape which hangs in the Vefsn museum and is made of blue or green wool damask to match the skirt and has a gold wool lining. and Norwegian Bunads, Kjersti Skavhaug, published by Hjemmenes Forslag, Oslo, Norway, 1991.